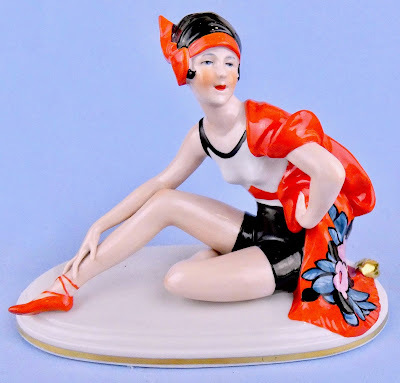 As the Victorian era passed into the Edwardian and Roaring Twenties, a market developed for bisque and china bawdy novelties and figurines of women in revealing outfits. Although now most of these figurines seem more coy and cute than ribald and risque, in their time they symbolized the casting off of the perceived restraints of the Victorian era. These little lovelies included bathing beauties, who came clad in swimsuits of real lace or in stylish painted beach wear, as well as mermaids, harem ladies, and nudies, who were meant to wear nothing more than an engaging smile. Also produced were flippers, innocent appearing figurines who reveal a bawdy secret when flipped over, and squirters, figurines that were meant to squirt water out of an appropriate orifice. Most were manufactured in Germany from the late 1800s through the 1930s, often showing remarkable artistry and imagination, with Japan entering the market during World War I. This fashionable flapper poses confidently in the finest beachwear of the late 1920s. Of excellent china and beautifully modeled and decorated, she is 7 inches long and 5.5 inches high. This same superb seaside siren is pictured in the catalog of Hertwig and Company, simply entitled "Badedame." 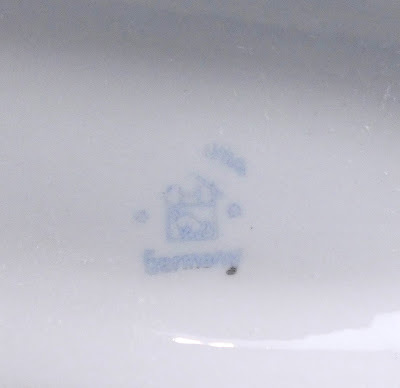 Even without the catalog, there is no question regarding her manufacturer, as underneath she is stamped in blue with the Hertwig mark featuring the silhouette of a cat inside the line drawing of a house, with a capital "H" tucked into the attic. The mark is a play on the name of the city of Katzhütte (Cat Hut), where the Hertwig factory was located. 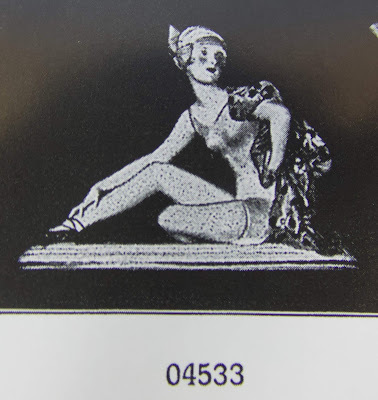 She is also incised "4533," which matches the model number in the catalog. Jeepers, Creepers, Avoid These Fake Peepers! The 292 All-Bisque Googlies, Old and New. Austin-sible Antiques, my booth on Ruby Lane, offering dolls, bathing beauties, and other unusual antiques. Bonnie Bull's "Flower Frog Gazette"
Elain Kewin is producing lovely new interpretations of a number of German bathing beauties and mermaids. Jean Nordquist, bathing beauty molds and doll making supplies. My nephew's blog about his Arabic summer study program in Jordan, featuring in-depth and interesting interviews. The SLO Mermaid Company is making new bisque versions of antique aquarium ornaments for collectors who cannot find or afford the scarce originals. New Post on my Maneki Neko Page! All contents protected by copyright. No reproduction without permission and attribution. Watermark theme. Powered by Blogger.